Black Locust (Robinia pseudoacacia) is a medium sized tree that you may notice in bloom right about now. Whether due to its profusion of white flowers or their sweet perfume, this tree stands out at this time of year. Sometimes also called Yellow Locust or False Acacia, it rarely gets taller than 80'. It is a short lived (generally under 100 years) member of the Pea Family (Fabaceae). Its Genus name was given in honor of a father and son team, Vespasian Robin and his father Jean, who served as botanists in French King Henry IV's court. Indeed, the oldest living tree in Paris is said to have been planted by Jean Robin in 1601 and is an ancient Black Locust. The Robins helped make locust popular throughout Europe where it was planted extensively. Here in North America, it has now been introduced into every state. A pioneer tree, locust grow fast and can take very poor soil conditions. Because it is a legume, enriching the soil due to the nitrogen fixing bacteria that dwell within their roots, it is often planted in strip mined locations to reclaim the land and to prevent erosion. It can bloom in 6-12 years after planting. 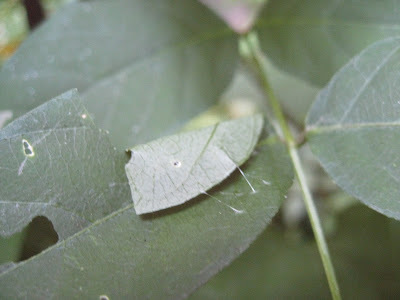 Black Locust have compound leaves and paired thorns. Because this is a young sapling, it has larger leaves and thorns than a mature tree. This tree has deciduous, compound leaves and paired thorns. The leaves are interesting in that they fold up and droop at night and during very cloudy weather. The flowers consist of hanging racemes of very fragrant, white flowers. These are extremely attractive to some bees. Black locust is considered a major honey plant, and honey made from its flowers is sometimes sold as "acacia honey." The flowers themselves are edible and sweet. In fact, I find them quite enjoyable myself, though I've learned to make sure ants are not sharing my enjoyment of them. In Romania, perfumed jam is supposedly made out of the blooms from introduced trees. Black Locust have fragrant, white flowers that hang in racemes, often with yellow centers. Pollinated flowers result in 4-14 seeds contained in bean-like pods. Although a pioneer species, this tree does not compete well with other plants. It is one of the trees most affected by the allelopathic chemicals that goldenrods produce and thus are not often found germinating in meadows near where the goldenrods are dominant. Most new growth results from root suckering, with new trees popping up away from the parent tree. These are all clones of the parent plant. Locust do not tolerate shade, so give way to other longer lived trees later on, having in some cases enriched the soil before their demise. Various native tribes made use of Black Locust. The Chickasaw used the roots to treat headaches. The Menominee flavored bitter medicines using locust bark. The Cherokee made the most use of it however. They chewed on it for toothaches and to induce vomiting. They made a bark tea from it and created both bows and blow gun darts from it as well. They found the wood useful for fences and as pegs in log cabins. They even gave it as a tonic to their cows. During the Civil War, Confederate Dr. Francis Porcher, charged with finding alternatives for goods no longer available due to Union blockades, listed several uses for Black Locust. He suggested that an antispasmodic syrup could be made from the blooms. He related that the flowers could also cause drowsiness and vomiting in infants, but that they could be fried and eaten. The inner bark could be used to make cordage and other rope. Porcher considered the wood to not only be useful for fence posts, but as wood tree nails in ship building. The durability of the wood means that Black Locust has often been used for fence posts and rails. The lumber is very rot resistant even when in contact with wet soil. Abraham Lincoln is said to have split many a locust log. It also burns very hot, but is prone to shooting coals out due to imperfections in the wood. Locust Borer Beetles are wasp mimics who feed on goldenrod flowers as adults, but bore inside Black Locust as larvae. Many of these imperfections in the wood are due to the work of outside organisms, the most prominent of which are the Long Horned Locust Borer Beetles (Megacyllene robiniae) which even bear the treesname as part of theirs. These drill through the wood as grubs, weakening the wood and causing splitting and dropping of limbs. Interestingly, these beetles are Yellow-jacket Wasp mimics who love to feed on pollen as adults. Ironically, their favorite flowers are those from goldenrods, the very plant who exudes chemicals that inhibit the growth of the locust trees. The galleries the grubs make open up the tree to the growth of fungi. The most apparent of these is a bracket fungus, Phellinus rimosus, which are easy to find on older trees. This, along with their intolerance of shade, may limit their age in North America, but they can live for a very longtime when freed from these limitations. The oldest tree in Paris I mentioned earlier is a good example, since the locust borers I believe are not found in France. Locust Bracket Fungus is often found on older trees and can result in heart rot in the trunk. Many other creatures make use of Black Locust. In fact, over 72 caterpillar species feed on it. This includes the larvae of a common butterfly, the Silver Spotted-skipper (Epargyreus clarus) which folds the leaves over itself to make its shelter. Although not a favorite, numerous animals feed on the seeds and browse the foliage as well. Silver-spotted Skipper caterpillars often fold leaves on the legume plants they feed on, using multiple leaves when they get to big to just fold one over themselves. 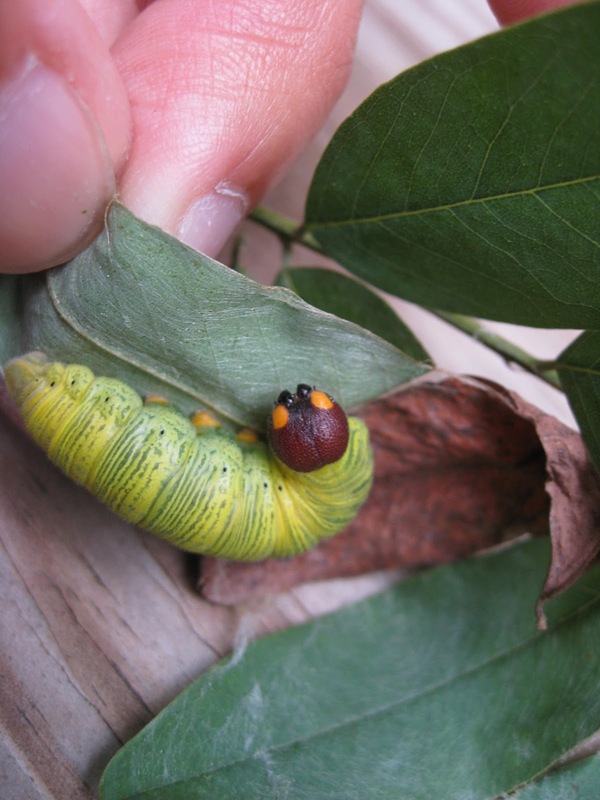 Silver-spotted Skipper caterpillars will try and scare you off with their fake eyes if their shelter is disturbed. As a child, I had two large Black Locust growing in my yard. I played under their shade, ate the sweet flowers, and occasionally cursed them when I stepped barefoot onto a fallen thorn. I even fell and was knocked unconscious once when I fell from high in its canopy, resulting in an ambulance ride and much concern to my family. So seeing these trees in bloom every year brings back all sorts of memories from my youth, usually made even more vivid since I can't resist but taste the flowers again every year. Arlington County, Virginia is very urbanized. Due to loss of wetlands (including vernal pools) and heavy development, half the frog and toad species that used to live in Arlington are now gone. The remaining species are often in small, isolated populations, in only a handful of locations. Frogs and toads are excellent bio-indicators if environmental health. Since they consume plant material when young and then switch to a predatory diet, they can build up toxins in both diets. Since they can also absorb chemicals and pollutants through their skins in all stages of life, they are also very sensitive to changes in the environment. So loss of frogs and toads can point to an unhealthy environment and their declines can serve as a warning about the state of the habitat. Conversely, their presence can often be a clue to healthy, clean water and their return perhaps signaling improving conditions. This is why we are happy that the frog and toad populations have been expanding in our Arlington parks. Take for example the current status of American toads, which during our surveys from 2005 to 2008 were found to be restricted to one wild location. We now have them in 6 additional places. Similar successes in expansion of range have happened for our Bulllfrog, Green Frog, and Spring Peeper Treefrog populations. In addition to having cleaner water and preserving our wetlands, the control and management of invasive plant species has allowed the habitats to support more insect food. Native plants that have also been making comebacks support more insect prey than the exotic invasive plants (and these insects then feed so many more animals such as most of our bird and all our bat species). Some of our frogs needed a bit more help in getting established. Such was the case for our Wood Frogs which are dependent on mostly fish-free vernal ponds and mature woodlands. For the longest time Arlington only had two places where they bred. In time, the population from Long Branch Nature Center eventually made it into Glencarlyn Park on its own. But since these frogs need mature woods and vernal ponds that may not be close to one another, we assisted in establishing new populations. Now these efforts have to be carefully considered. First of all you need the right habitat with established woodlands and fish free vernal pools. They need to have enough invertebrate prey to sustain them. We felt we had a couple of locations where we had controlled invasives, had mature forest, and could provide the wetlands they needed to reproduce. During the last year of service from our Americorps volunteers, they helped us create some vernal pools in one of our Natural Resource Conservation Areas. An Eagle Scout project provided similar service in another park that contained another Natural Resources Conservation Area. With these things in place, we decided it was worth the effort to try and establish new colonies of Wood Frogs. But another concern was the potential introduction of two new diseases (Chytrid and Ranavirus) which were affecting amphibian populations. Luckily for us, the pond we used for stock was tested for these diseases. It ended up being part of two studies, mostly through the Smithsonian, and eventually came up as being clean. Now we have more breeding populations of these woodland frogs. We've recently tried to create additional vernal pools, in locations where we hope the existing frogs can expand their range. We've also made efforts or plan on creating more ponds on the opposite side of such existing barriers as creeks and roads that make their migrations to the breeding pools very dangerous. Despite such programs as our "Stop the Stomp" volunteers helping to guide them across roads, we want to provide them with pools closer to locations so they need not make these dangerous journeys. As our habitat for these amphibians improve, they do so for many other animals as well. Hopefully Arlington will continue to make strides in providing habitat for the return of many other animals and plants such as these frogs. The drupes are an important and favored food for birds, being high in fat content. Over 98 species of birds have been documented eating its fruits. Unfortunately, a fungal disease called Dogwood Anthracnose is spread very easily, being picked up by the bird in migration when it stops to eat and then transferred further along the migration route to yet other Flowering Dogwood trees when the bird lands again. This is killing a high proportion of the trees and was likely brought over in the horticultural trade on Asian Kousa Dogwoods which are resistant to the fungus themselves, but can act as carriers and infect the natives. Flowering Dogwood has a deep ethnobotanical history. Native American Indian tribes made considerable use of it. The Cherokee, among other tribes, for example chewed the bark for headaches, and used other parts to treat for fever, diarrhea, measles, and intestinal worms. The twigs could be used for toothbrushes of sorts and had a reputation for whitening teeth among not just the indigenous people, but Africans whether slave or free, and throughout the South. During the Civil War when the Confederacy was particular short on supplies, Flowering Dogwood was officially sanctioned by Dr. Francis Porcher in 1863 in their official ethnobotany manual as "one of the most valuable of our indigenous plants." It was used by the South in many of the same ways as by the native peoples, but also as a substitute for Peruvian quinine in treating malaria, as a dye, for stomach issues, for durable hand tools, and was preferred in the manufacture of gun powder. One version of how it received its common name refers to its supposed use in treating dog mange, thus "dogwood." Others say the name is derived from the "dags" or dagger-like skewers when people used them for cooking. "Dagger-wood" eventually turned into Dogwood. As you can see, there is much more to this plant than just it's good looks. It serves as the caterpillar host plant to 112 different butterfly and moth species. Whether in its roles in feeding our wildlife or traditional medicine, this is a tree worthy of being a state symbol.